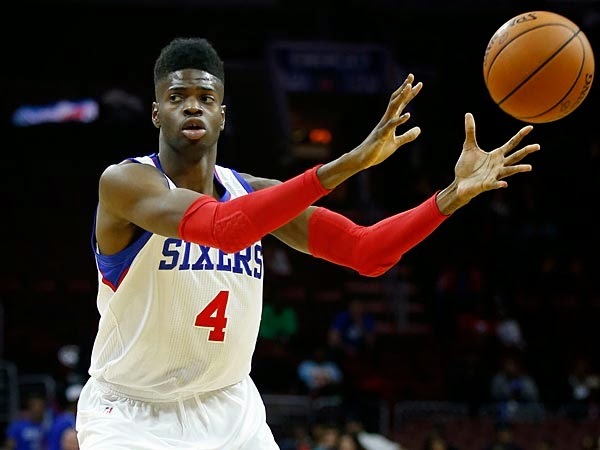 Philadelphia, PA -- Nerlens Noel scored 14 points and added 13 rebounds and three blocks to help the Philadelphia 76ers top the Washington Wizards, 89-81, on Friday. With a balanced attack, the Sixers were able to snap their five-game losing streak. Robert Covington scored 13 and Jason Richardson netted 12 with four 3-pointers. Washington lost its sixth straight and continued its descent down the Eastern Conference standings. John Wall scored 21 points on 26 field-goal attempts with 11 assists, and Otto Porter contributed 19 points. "You gotta keep playing. There is frustration out there. No question. We need guys to step up," Wizards coach Randy Wittman said. The 76ers came out of the half cold, missing their first six shots and allowing the Wizards to turn a five-point halftime deficit into a six-point lead. At 7:17, Richardson's 3 finally ended the drought, and Philadelphia hit three straight shots to get back in a rhythm. The rest of the third was back and forth. In the final minute, Thomas Robinson's offensive rebound set up a Hollis Thompson 3 that gave the Sixers a 63-61 lead with a quarter to play. Philadelphia would not trail again. The Sixers used six free throws in the first two minutes of the fourth to go up eight, but the Wizards fought back. With 4 1/2 minutes to play, Porter hit a triple to cut Washington's deficit to one. Wall had a chance to put the Wizards back in front on the following possession but missed the mid-range shot. His 19 misses from the floor set a personal season-high. In the closing minutes, Noel preserved the lead with a pair of dunks and hit 3-of-4 attempts from the free-throw line. "We wanted to go out and get established on defense," said Noel. "We did a great job tonight holding them to 81 points." The 76ers got off to a quick start by hitting their first five shots from the floor. Richardson and Isaiah Canaan each hit 3s, and Canaan added a three- point play to jump out to a 13-4 lead and force a Wizards timeout. After the stoppage, the 76ers' shooting went cold but they still held a 28-25 lead after one. Ramon Sessions scored the first seven points of the second period to give Washington its first lead of the game. At the other end, the Sixers' shooting remained off until Jerami Grant's triple at 7:40. With 5 1/2 minutes to play before the half, Covington converted a four- point play that put Philadelphia back in front. The 76ers finished the quarter on a 9-2 run to lead 47-42 at the break. Notes: Philadelphia ended a four-game losing streak against Washington ... The Sixers made 10-plus 3-pointers for the fourth game in a row ... The Wizards entered the game 12-0 when allowing fewer than 90 points ... Wizards forward Paul Pierce missed his second straight game with a knee injury.